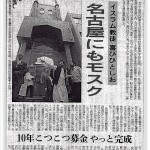 In July 1998, by the immense blessings from Allah, and the generous financial support from our brothers and sisters in Islam, Nagoya Mosque officially opened its doors. The Inauguration Ceremony of Nagoya Mosque was attended by Shaykh Salih bin Humaid, the Imam of Masjid al-Haram, along with the Ambassador of Saudi Arabia to Japan. We were privileged to be gifted part of the black cloth covering the Kaaba by King Fahd bin Abdul Aziz, through the honorable guests. The Ceremony was covered on Nagoya based TV station as well as on newspaper. Below is an excerpt from the Asahi Newspaper dated July 24th.